It’s a great time for a winning streak, especially the first one of the season. 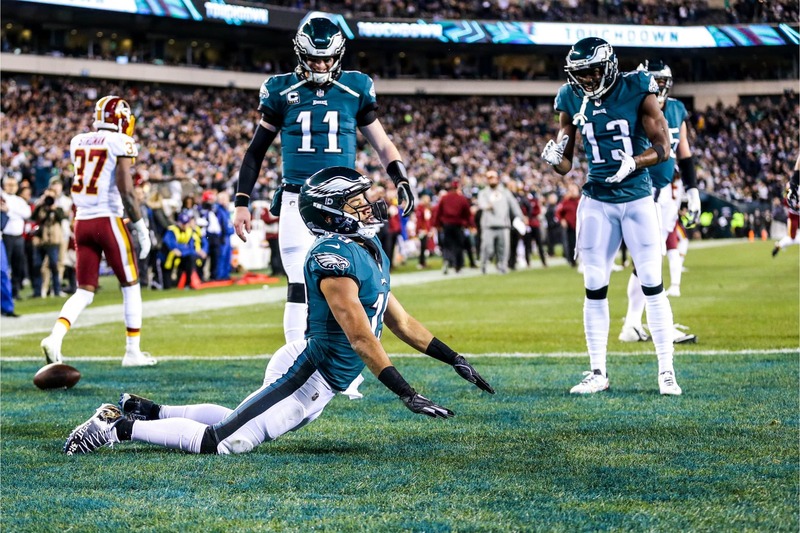 The Philadelphia Eagles’ momentum is building and they earned back-to-back wins for the first time following their 28-13 victory over the battered and bruised Washington Redskins with a monumental showdown looming in Big D Sunday afternoon. Doug Pederson doesn’t think the Eagles are there yet, but getting close. Areas that were huge concerns are getting rectified. The Eagles scored a touchdown on their opening possession after not scoring points in 9-of-11 first quarters, Josh Adams ran the ball 20 times again to success for the offense and the defense held the Washington Redskins to 36 yards in the second half after holding the New York Giants to 56 over the final 30 minutes. Adams’ emergence is beginning to loom large. He gained 85 yards for a 4.3 yards per clip, including five totes for 28 yards on the Eagles’ beautifully orchestrated opening drive. Pederson spoke about the Eagles’ first opening quarter scoring drive in five games. Adams was also given the rock four times for 22 yards on a key 10-play field goal trek in the fourth quarter when the Eagles drained 5:14 off the clock. This was also another weakness for Philadelphia earlier in the year, figuring out a back who can gain the gritty yards in the fourth quarter like LeGarrette Blount did in 2018. Carson Wentz was 27-of-39 for 306 yards and two scores, but left yards out on the field and had a poor goal-line interception when he threw behind Alshon Jeffery and Josh Norman undercut it for the interception. His mechanics were off and didn’t appear to be setting his feet consistently. He missed a couple touch throws in the first half, had the poor pick in the red zone, misfired badly on a 3rd-and-3 crossing route that would’ve given the Birds a first down. He did bounce back from the pick to lead the key touchdown drive that bled into the fourth quarter and gave the Eagles a two-score lead. Wentz hit Jordan Matthews for the 4-yard TD pass on 3rd-and-goal to complete the 15-play, 85-yard march. Then Wentz rolled to his right to find Golden Tate for the two-point conversion and a 22-13 Eagles lead with 14:10 to play. Wentz did have his highlights. This backyard play where he lofted this sick touch throw to Golden Tate down the left sideline was awesome. With Adams running the ball effectively, it opened up the offense and helped out the offensive line, which didn’t allow a sack. Jason Kelce was also a beast in the screen game, which Corey Clement did a better job in following him and his blockers gaining 47 yards on three receptions. Kelce’s block on Darren Sproles’ 14-yard touchdown may have been the highlight of the game. He drove Mason Foster back 10 yards with his right arm and then got another block with the left to spring Sproles free, wow! The Eagles are also getting better production in blitz pick-up from their backs, evidenced by this block by Clement, which freed Wentz up to make this 39-yard completion to Nelson Agholor. Philly was in control of the Redskins for most of the game, but led by just a point at the break 14-13. Colt McCoy broke his right fibula, however, and Washington was left with Mark Sanchez. It wasn’t until the TD drive in the early stages of the fourth when the Birds broke it open. Golden Tate hauled in all seven of his targets for 85 yards and a score. The Eagles have been using more bunch and stack looks in the slot with several different looks as a way to integrate Tate into the offense. Pederson spoke of it. Wentz believes the chemistry with Tate is improving. He also thinks the offense is meshing. Adrian Peterson broke off a 90-yard touchdown, the longest run of his career, but the Eagles’ defense limited him to eight yards on his other eight carries. The Eagles might almost be there, but they have to be all the way back Sunday if they want to beat Dallas and tie the Cowboys atop the NFC East.